Wondering where to stay in Playa del Carmen? The first thing you need to decide before booking accommodation in Playa del Carmen is what kind of vacation or experience you want here. If you want to party then stay in El Centro. If you want to want to spend a week sipping Mojitos on the beach then you probably want to avoid El Centro and choose one of the big resorts. 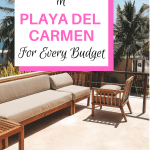 In this post, I have broken down everything you need to know to help you decide where to stay in Playa del Carmen including recommendations of places I know you will love. I have been living in Playa del Carmen for some time now so although I haven’t stayed in many of these places myself, I have visited them all and/ or I have friends who have stayed there and had great experiences. 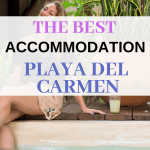 This list is, in my opinion, a list of the best accommodation in Playa del Carmen. But first, let’s talk about the different areas in Playa del Carmen to help you decide where to stay. If you decide to stay in El Centro you need to be careful of your location. Especially if you are booking an Airbnb. As a general rule only book places between Juarez and CTM and on the beach side of the federal (or Avenida 50). I’m not saying you won’t be safe anywhere else because there are safe areas outside of the main downtown area. It is more for convenience, especially for first-time visitors without a car. The main avenue is 5th known as La Quinta. Aim for accommodation as close to here as you can so you can walk everywhere. Bikes are also cheap to hire and saves walking in the heat. You will find plenty of accommodation choices in this main area so there is no real need to go outside of this. Playacar is a huge gated community in Playa del Carmen full of luxury resorts, condos, villas, and a rather huge golf course. It is the main area for people traveling here on vacation who just want to spend a week or two in a big resort. It is a very safe area and a popular choice for families. In Playacar, you will find everything you need, the beach, small shopping malls, and even some Mayan Ruins. Another reason why many people are attracted to Playacar is its greenery and quietness. You can hear the birds sing in the morning and see wild animals like raccoons, monkeys, iguanas, squirrels and many more. There is also a large expat community who lives in this area. It feels more like a gated city it is so large! It is also located just to the south of downtown so you can easily access the 5th Avenue area. The only cons are if you are staying deeper in Playacar you may need to take a taxi and taxi drivers will charge extra to get into Playacar for both pickups and drop-offs. Right in the center, one of the oldest communities in Playa, therefore, some house are a little rough on the edge but most of them have been renovated. Lovely, small, safe and quiet area with a refreshing park in the middle that comes with a palapa that can be rented for events. The neighborhood is a pleasant mix of nationalities. It is close to restaurants, supermarkets, oxxo, laundry place, and the beach and 5th street are directly down the street, less than a 10 minutes walk away. It’s close to the higher end tourist dining and bars as well as close to the local cuisine found on 30th Ave.
One of the most well known gated communities outside of the center. New, beautiful, quiet and secure neighborhood with swimming pool, sunbeds, green areas and palapa for gatherings. Ideal for families, much cheaper than staying in the center, you can get an entire apartment for 800 pesos a night, it’s a bargain! Oxxo is only a few steps away, supermarkets 2km away, 8 km to the ADO bus station and a 10 min drive to the beach and 5th street. A taxi costs around 70 pesos to the center, public transportation leaves right outside, or the most comfortable way is to rent a car. This was the area I stayed for a week when I first moved to Playa. It is a nice quiet area and the house I was in was inside a gated community and seemed very nice, if not a little run down. The beach is a short bike ride away and there is an OXXO close by. However, it is quite far away from downtown and a taxi will cost between 70-80 pesos. I would recommend hiring a car if you decide to stay here. Two other communities that I can recommend are Selvanova and Bosque Real, being very similar to Real Ibiza, they are safe, quiet and also come with a swimming pool, green areas and a palapa. Which makes these 3 neighborhoods the ideal place to stay if you are traveling with your family or with a group of friends. This is one of the best hotels in Playa del Carmen, well actually it is rated as the best. It is a 5* resort with prices starting at $319 per night. They offer an all-inclusive option which is probably worth taking. The resort is located just outside Playa del Carmen (about 15 minutes in a taxi to downtown) next to a golf course. There are five swimming pools, a huge spa, restaurants, and bars for you to enjoy on site. They offer enough entertainment and activities that you could quite happily never leave the resort at all during your stay. There are many resorts in Playa del Carmen for you to choose from. 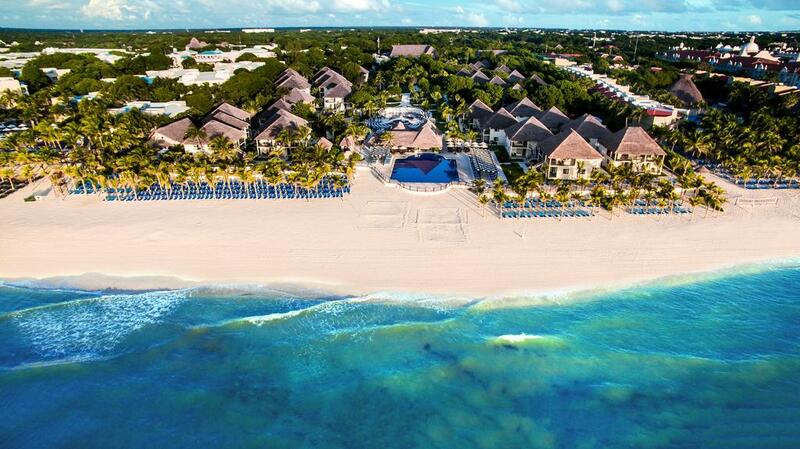 If there is one thing the Riviera Maya does well it is luxury resorts! If you are looking for a luxury resort in downtown Playa Del Carmen this is a perfect choice. It is located in the heart of Playa del Carmen so you have easy access to the main shopping and nightlife areas while still getting to enjoy a stay in luxury. Located on the beach there are two outdoor pools, daily yoga classes, and they even have an on-site scuba diving center. The Carmen is one of my favorite hotels in Playa del Carmen. Set on the beach with affordable stylish rooms it is a great place to stay especially for travelers who want to live the good life in Playa del Carmen. They have a fabulous rooftop bar where you can party from 2 pm most days (Friday is ladies night so chicas you can drink for free). And on Sundays from 4 pm, they have a free salsa class right on the beach. It is located in the main downtown area so everything you need is a short walk away. Even if you don’t end up staying here I highly recommend visiting Deck five (the rooftop bar) it is one of the few rooftop bars in Playa that you don’t have to pay a cover for using the pool… plus they have amazing sushi and cocktails! This hotel is actually opposite the Carmen. It has for me a more mature vibe than The Carmen so if rooftop yoga is more your thing that rooftop pool parties then this is a great option. They have a much nicer beach area than The Carmen and they have a small pool that guests can enjoy. I love the bar area here, although it is pretty pricey so be sure to check the specials or take advantage of their happy hour! If you are looking for a luxury ALL Inclusive resort in the center of Playa Del Carmen the Hilton is an excellent choice. A luxurious, adults only, all-inclusive beachfront resort that offers exceptional service, first-class amenities, and endless activities and entertainment. You can enjoy all-suite accommodations, endless food and beverage options and extensive amenities, it is ideal for couples, incentive trips and wedding parties. Located on the beach, but only a short walk away from the famous 5th street, it comes with its own daylight club Coralina, a luxurious spa, an Olympic-sized pool, a fitness center, a tennis court, fun water activities and classes. What else could you wish for? The resort offers the complimentary Grand Velas Kids’ Club for children ages 4 to 12 and the Grand Velas Teens’ Club for guests ages 13 to 18. Both programs host a variety of age-appropriate activities, including arts and crafts, movies and video games. There’s also a dedicated Baby Concierge to assist with baby-focused necessities and recommendations, including a “baby’s first haircut” service. In Playa del Carmen boutique hotels are on every corner! It seems like a new one pops up every month. Although I must admit I have stayed in a few claiming to be boutique and they most definitely were not! So, if you are looking for Boutique hotels in Playa del Carmen these are the ones I recommend. I’m not sure if this is a new hotel or if they have been through a refurbishment. Either way, it is adorable! Located close to 5th Avenue it has a collection of 20 uniquely designed rooms and suites. 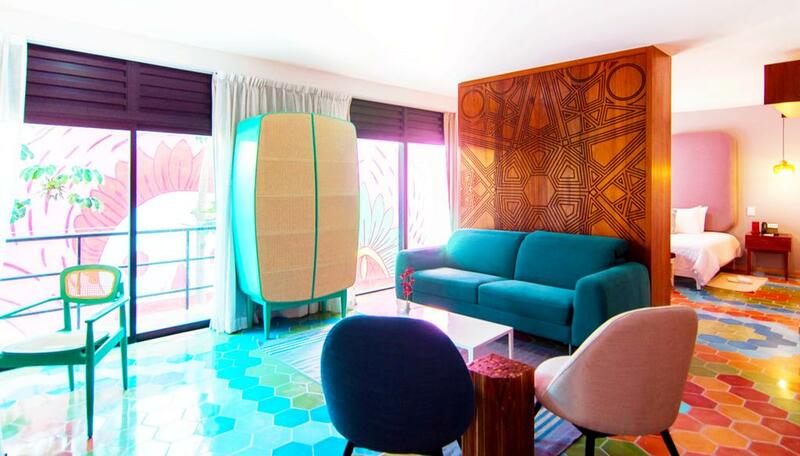 Each room has a different style and theme all very Mexican. They have a rooftop terrace with pool, bar, and restaurant with sea views. Although you will find plenty of choice on Airbnb (I have added a few recommendations below) these apartments are a great option if you prefer an apartment to a hotel. The main benefits are being able to cook for yourself and having more space than you would in a hotel. The apartments are very close to the ADO bus station, the beach, and 5th Avenue, making the location perfect. There is a pool, rooftop area and the rooms all come well equipped. If you prefer Airbnb I lived at Elephante Blanco studios for 3 months and loved it there. The WiFi is strong and I really liked this area. Where I currently live also have one studio on Airbnb and I recommend it as a great place to stay. It is in a quiet more local area of Playa del Carmen close to 5th with plenty of cheap food options close by… Plus if you stay here you would be my neighbor so make sure you say hi! Want to save $32 on AirBnB? Click here. 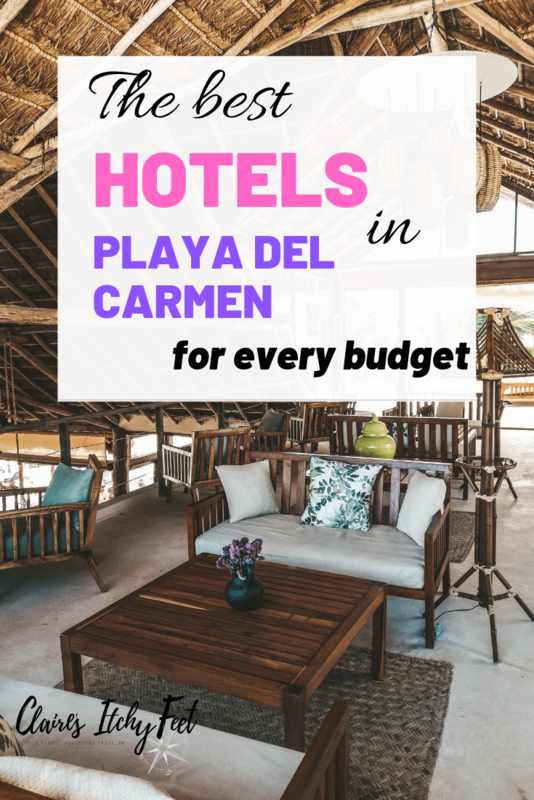 If you are looking for budget hotels Playa Del Carmen you will find plenty of choices! My personal favorite is The Fives. Expect to pay about $100 per night here, worth every penny though when you see it! It may not be located on the beach but the view from the rooftop bar and pool make it totally worth the 5 min walk to the beach. 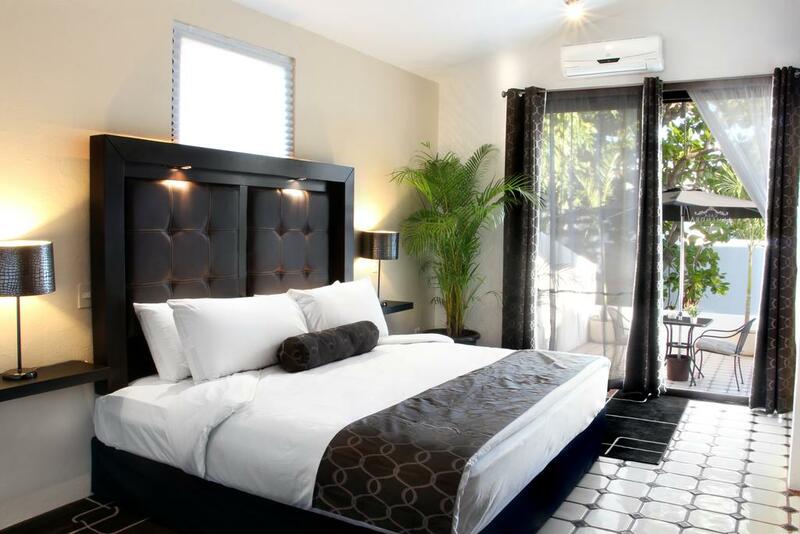 If you want to be in the heart of downtown Playa del Carmen and live the good life, stay here! 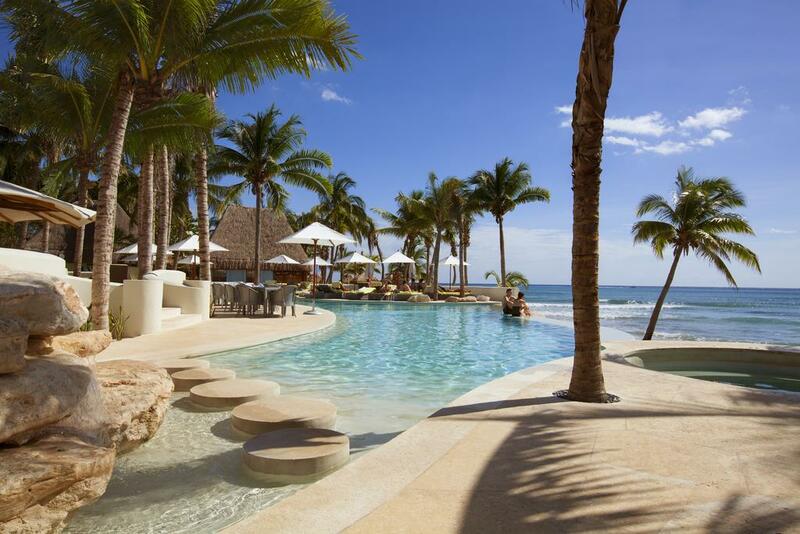 Looking specifically for Playacar resorts? Many people, especially first-time visitors, prefer to stay in Playacar as they feel safer there. It is a gated community so it is very safe, however having lived in Playa del Carmen for some time now it is a safe place for tourists, just to put your mind at ease! Ok, this isn’t a hotel, but if you ask me it is better! If I had to spend a week in Playacar I would 100% be spending it here with a few friends. The location is great as it is a short 15 minutes walk to the 5th street, so it will save you having to take taxis everywhere and you have a private beach area. I often walk past this place and I always want to stay here. It sleeps 10 people and it is around $500 per night, making it very affordable if you have a large group. This is another great option if you prefer the security of being in Playacar but still want to be within walking distance of El Centro, a 20 minutes walk to the 5th street. This Playacar hotel is surrounded by greenery and just a few meters from the beach. Looking for an all-inclusive resort in Playacar. This one is my personal favorites! It has a private beach area with 3 outdoor pools, tennis courts, and a spa. What I love is that the accommodation is in Polynesian-style bungalows and they have 4 restaurants, 4 bars and 1 disco with a bar so you could quite happily just chill here for a week without ever having to leave. All of the above out of your budget? No problem, you need a Playa del Carmen hostel! There is plenty of choices if you want a bed for a few nights here but these three hostels are ones I can personally recommend. They all have a great vibe, are super social, and have good facilities. If you want a party hostel in Playa del Carmen this is my number 1 choice. They have an activity coordinator there whose job it is to just plan parties and daily activities! I know most of the staff there and so I’ve been to a few of the social events and I have always had a great time. If you are a solo traveler it is a great place to stay as it is a very sociable hostel with something happening every day you can join in with. This is another hostel I have spent a lot of time at. I had a friend who was staying here for a few months and so I visited regularly to hang out on the rooftop bar. They also have a small swimming pool and downstairs social area. The staff are super friendly and there is always some kind of party, or activity happening. This hostel is particularly popular with Argentinians so great if you want to practice your Spanish, although I never had an issue speaking to the staff in English too. Also, they have bikes you can use. If you are a Digital Nomad you will already be familiar with Selina I’m sure. They are a popular chain of hostels offering co-working spaces perfect for Digital Nomads. The Selina in Playa is in a great location on Calle 2 just off 5th Avenue and they have a great space including a swimming pool, bar and or course co-working office space. There is always some kind of event, party or local market happening here and it is somewhere I visit on a weekly basis. It is a little bit more expensive than the other two hostels, but worth it if you need to work remotely while in Playa. I love Playa del Carmen and can’t recommend it enough as a place to vacation or even live. It is much smaller than Cancun but bigger than Tulum. The vibe in all three places is so different. But for me here in Playa you can strike a happy medium. 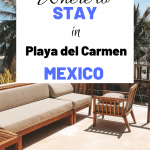 I hope you have found my Playa del Carmen best places to stay post useful and I hope I have helped you to find the perfect place to stay at.